Katrina is a critically acclaimed flautist and holds a Master of Performance and a Bachelor of Music degree from Sydney Conservatorium of Music Australia. Whilst studying, Katrina was principal flute of Sydney Youth Orchestra, Willoughby Symphony Orchestra, the Conservatorium Chamber and Symphony Orchestras and gained her Associate and Licentiate Diplomas from the Australian Music Examination Board. After a series of live broadcasts and recordings, Katrina won the ‘Young Performer of the Year 2000’ from the classical radio station 2MBS-FM, and in 1999 won the Magic Flutes International Championships and the MBS award for ‘outstanding flute playing’. 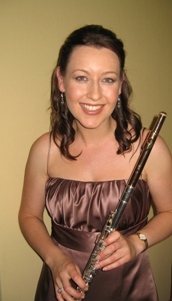 Katrina won the 8th Australian Orchestral Flute Competition as part of the Australian National Flute Convention in 2005. She has given many solo and chamber recitals, the most notable two recitals being in 2000, as part of the Olympic Arts Festival in Sydney. where she was on a Tait Memorial Scholarship, studying with Peter Lloyd from the Royal Northern College of Music. Katrina also worked as a freelance musician in orchestras, as a soloist and performed many recitals. She attended many prestigious summer schools around Europe, including the International Summer Music Academy in Nice, the Oxford Flute Summer School, The William Bennett Summer School and spent a summer at the Mozarteum Summer Academy of Music in Salzburg, where she gained a diploma. Katrina continues to work with Sydney Symphony Orchestra, the Australian Opera and Ballet Orchestra, Sydney Chamber Orchestra and is principal flute with Willoughby Symphony Orchestra, as well as giving solo recitals, radio broadcasts, premiering new Australian works, performing concertos and performing for corporate and charity events as part of various chamber groups.